Woulda-Shoulda: Well, if I wasn't working towards a deadline I would have actually stopped and corrected some of my lace mistakes. The lace is somewhat forgiving, it also helps that this particular garment is worn on the feet. So unless my mom hang's around people with insane foot fetishes the mistakes will probably go unnoticed. So I'm not worried. Other than that, the lace is VERY easy and the socks can really soar especially if you're knitting like a bat out of hell! My only criticism of the design would be the really tall heel. I'm not sure if that's because my row gauge was off or if it's designed like that. It looks a little funky, but not too funky that I would trouble myself with modifications. I highly recommend. 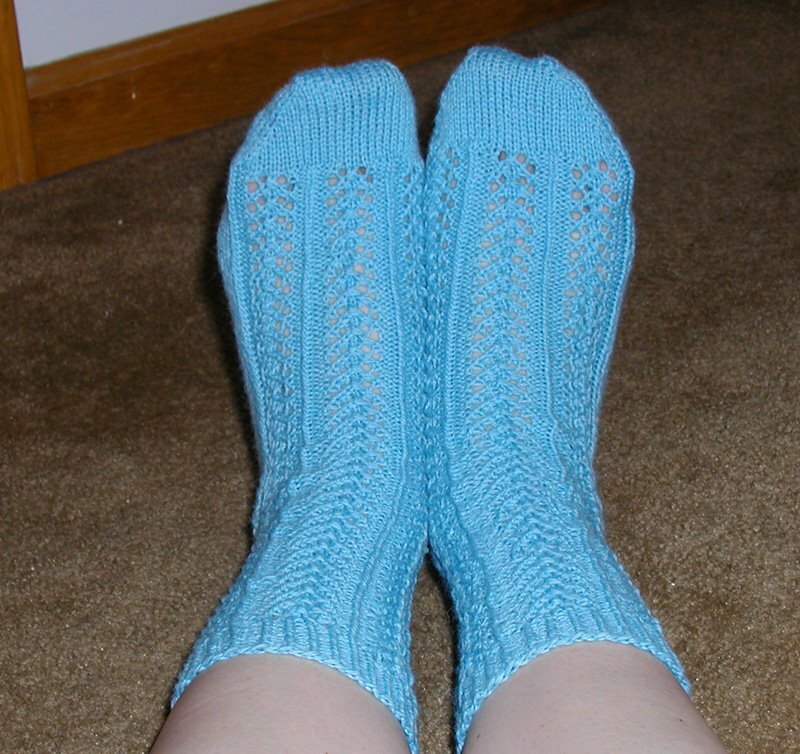 But I would definately look into a cotton or cotton blend yarn if you want to wear these in the summer. They're quite toasty in wool, even with all those holes. So pretty! And a beautiful color. Great socks! Your mom is going to love them. Your mom will love those socks! They're awesome! Love the socks, and mom will love them! Great springy color, too! Thanks for reminding me that I have to start that blanket soon too! Which means a yarn expedition...what kind of yarn are you using for it?